The third report on the 96th FAI General Conference, which was held from 9 to 11 October 2003 in Krakow, Poland, focuses on the new FAI Strategic Plan and on one of the projects launched within the context of the FAI Centenary in 2005. As already mentioned in our Press Release 04/03, FAI will mark its Centenary by publishing a 224-page book (English and French) covering the history and the development of FAI and Air Sports. Mr Pierre Morath, a sports historian, started research work in March 2003 and we now have pleasure in publishing the provisional Table of Contents. In 2004, a subscription campaign will be launched, inviting you to place pre-orders for the book which will be published in March 2005. FAI Members, Air Sport Commissions, Museums and Companies wishing to personalize their books will have the opportunity to have their own logo printed at the beginnning of the book. - The FAI : role and mission at the dawn of the 21st Century. Adopted by the Executive Board at the beginning of 2003, the new FAI Strategic Plan presented at the General Conference forms a long-term vision to guide FAI activities for the next 3 to 5 years. The main goals depicted in the Strategic Plan are to modernize and promote the image of FAI and Air Sports, to develop attractive international competitions, products and services, and finally to increase the proportion of financial revenues coming from external commercial sources. The first projects resulting from the new FAI Stratetic Plan have already been launched in 2003, and should bear fruit in 2004 and 2005 : among other projects, a new Corporate Identity and Communication Strategy will be introduced in the course of 2004, the exploitation of FAI Archive and World Record Files will be improved, and the organization of several public events has been launched to celebrate the FAI Centenary in 2005 (further details about the FAI Centenary will be given in a forthcoming FAI-News). The success of the FAI Strategic Plan relies on the whole FAI Community sharing responsibility for achieving these goals. Each person involved in Air Sports can contribute to these efforts and create positive effects for the whole Air Sports community. Therefore, we invite you to read the basic principles, visions, goals and priorities contained in the FAI Strategic Plan by downloading the leaflet (242 ko) available at http://www.fai.org/documents. (To better understand its content, please print this PDF file recto-verso on an A4 sheet of paper, then fold the document in 3 equal parts). The FAI General Conference has unanimously adopted a Code of Ethics which applies with immediate effect to all who participate in FAI, whether as competitors, judges, jury members, delegates to Commissions, elected officials, staff members or in any other capacity. Please take note of the contents of the Code, and bring it to the attention of all those who are active on the international air sport scene, in whatever capacity. The 96th FAI General Conference was held from 9 to 11 October 2003 in Krakow, Poland. A small FAI delegation led by the FAI President had the honour of being received by the President of the Republic of Poland, Mr. Aleksander Kwasniewski, at the Presidential Palace in Warsaw. 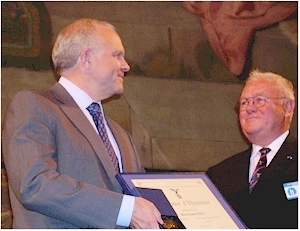 After a well-attended Opening Ceremony, at which Steve Fossett was awarded the FAI Gold Air Medal, delegates representing 42 nations and 10 international Air Sport Commissions, discussed - among many other subjects - World Air Games, a Code of Ethics, the introduction of a new visual image, and the program for the celebrations of FAI Centenary in 2005. The ceremony was held in the splendour of the Opera House of Krakow, with over 400 guests present. After words of welcome from Mr Jan Tadeusz Karpinski, President of the Aero-Club of Poland, Mr Wolfgang Weinreich, FAI President, evoked the last FAI Conference held in Poland in 1936, and stressed the continuity of FAI’s activities. The Secretary of State for Sport, Mr. Adam Giersz conveyed a personal message from Prime Minister Leszek Miller and officially opened the 96th FAI General Conference. Several persons and groups who had served the cause of aviation and air sports were recognised for their work. The FAI Gold Air Medal, FAI’s highest award, was awarded to the renowned aviation record-breaker Steve Fossett, who flew in specially from America to attend the Awards Ceremony; Mr Fossett also received the De La Vaulx Medal (his fourth) for the Absolute Ballooning World Record he set on 3 July 2002, when he set a new mark for the shortest time around the world (320h 33mn) on his solo earth circumnavigation aboard "Spirit of Freedom". For further information about Awards Recipients present at Krakow : FAI Awards 2002 (zip / 1,4 Mo). New FAI members were admitted from Malaysia, Thailand, and Paraguay. Taking into account the decisions made in Krakow, FAI membership now stands at 78 Active members, 12 Associate members, 9 Temporary members and 3 International Affiliates (102 in total). The General Conference was informed about the 2004 international calendar for sporting events (http://events.fai.org/) and the FAI meetings for the next 12 months (http://www.fai.org/general/meetings.asp). For detailed information, please refer to the permanently updated Internet pages mentioned above. In the coming days and weeks, FAI will issue further reports about topics covered at the 96th General Conference, including World Air Games, FAI’s Strategic Plan and Corporate Identity, and the FAI Centenary in 2005. FAI was founded on 14 October 1905 in Paris by representatives of aeronautical organisations from Belgium, France, Germany, Great Britain, Italy, Spain, Switzerland and the USA. The first 100 years of FAI will be celebrated in 2005 with events in Paris, the city that hosted FAI from its foundation until 1998, and in Lausanne, the Olympic Capital and present FAI Headquarters. The 95th FAI General Conference held last month in Dubrovnik was informed about the planned events. Falling within the scope of new objectives set to promote FAI and air sports, the celebrations of the FAI Centenary will address not only the air sport community, those who practise air sports for competition or as a leisure activity, but also the public in general and young people in particular. Young people of today are the decision makers and “Air Sport Persons” of tomorrow; FAI needs them ! Under this motto, the Centenary will represent an excellent opportunity to show how FAI contributes to young people’s basic aeronautical education, encouraging them to discover the fascination of flight. As several important technological developments in the 20th Century originated from competitive air sports and record-breaking, the aeronautical industry will of course be an integral part of the event. Paris : As FAI was founded in Paris in 1905, the Aéro Club de France will host the official commemoration of the first 100 years of FAI during the FAI General Conference to be held in Paris in October 2005, on the precise anniversary of the foundation. Lausanne : The Olympic Capital and present location of FAI Headquarters, will focus on air sports as they are practised at the start of the new century. With the support of the Aero Club of Switzerland, the FAI will present air sports to the public and to the international sporting community with an air display and several events disseminated throughout the city and throughout the year. A book about the history of FAI and air sports will be published in 2005. The Year of Records : The celebration of FAI’s centenary will not be limited to the official events in Europe. FAI would like 2005 to be the Year of Records world-wide, by promoting the spirit of competition on all continents. It is intended that FAI and its Air Sports Commissions will encourage attempts on records by laying down a challenge in each discipline, and by launching new competitions. Visual Image Project : This aims to give FAI a completely modernised corporate identity. The project, which already started a few weeks ago, will be progressively introduced from the beginning of 2004 and will be accompanied by the renewal of all promotional material, medals, diplomas and Internet pages. Starting at the end of 2003, a new part of FAI’s Internet site will be dedicated to the Centenary, allowing everybody to keep themselves informed about the progress of the projects described above, and helping to arouse interest in taking an active part in the events. FAI Centenary will be a unique opportunity for the public, the world of sports and industry to be associated with the strong and unified family that FAI forms, through its national Members and international Commissions, all sharing a common passion, the passion for flight. The “FAI Corporate Patrons” Programme will start early in 2003 and offer exclusive services to manufacturers whose products contribute to the setting of aeronautical or astronautical World Records. A resolution to this effect was adopted by the 95th FAI General Conference held from 7 to 13 October 2002 in Dubrovnik. FAI “Corporate Patrons” - a new link between industry and air sports. FAI recognises the achievements of pilots and parachutists (the holders of FAI sporting licenses who establish World Records), but until now has not recognised the manufacturers of the various aircraft and equipment used to achieve these performances. Manufacturers nevertheless show great interest in the FAI World Record system : some of them (Boeing or Airwave for example) already successfully use FAI World Records to promote and sell their products. In launching the new “Corporate Patrons” Programme, FAI offers its future corporate affiliates a range of services and benefits to maximize their exposure after having set FAI World Records. By joining the programme, Patrons will publicly demonstrate their support for Air Sports. FAI affiliation will not form a prerequisite for records to be considered, but will be offered as an additional option with two levels of affiliation, each giving rights to specific benefits. Corporate Patrons will be free to select their level of affiliation. Usually, FAI ratifies a World Record only in the name of the pilot, parachutist or crew. Gold Patron companies will also have the record ratified in the name of the aircraft/equipment manufacturer, sponsor and/or organiser of the performance. An FAI Corporate Patron will be entitled to have a limited number of World Records ratified each year free of any FAI administration fee. Other services include special discount rates to use the FAI logo, an invitation to the FAI Awards Ceremony to collect record diploma(s), a free subscription to FAI newsletter, a special mention on the FAI Web site and priority treatment for exclusive invitation or sponsorship opportunities at FAI Events and Championships. In addition to all benefits granted to Gold Patrons, Platinum Patrons will benefit from special additional customized services : a co-branded FAI/Patron Web page displaying the history of the record set by the Patron, and the possibility to organise company or product presentations at FAI General Conferences. Finally, Platinum Patrons will be invited to nominate a representative to the FAI World Records Advisory Forum. This forum will give them the opportunity to submit feedback and technical recommendations on rules governing World Records, or to bring to the attention of FAI areas of technological development where new records might be achieved. Detailed information about “FAI Corporate Patrons” will be available early in 2003 at www.fai.org. Companies wishing to automatically receive further information when published are kindly invited to show their interest by sending a short message to our specially dedicated e-mail address : corporate-info@fai.org. The 95th FAI General Conference was held from 7 to 13 October 2002 in Dubrovnik, Croatia. After accepting 7 new countries as FAI Members, the Delegates, who represented 44 nations and 9 international Air Sport Commissions, discussed amongst others subjects the 3rd World Air Games, a new concept for FAI Corporate Patrons and the FAI Centenary in 2005. The FAI President and all the members of the FAI Executive Board were re-elected for a new term of two years. The General Conference accepted the following countries as new Active members of the FAI : Bulgaria, Nepal, People’s Democratic Republic of Korea (re-admission), Saudi Arabia (final acceptance subject to receipt and approval of Saudi Aviation Club Statutes) and Peru (final acceptance subject to payment of the appropriate fees). The Science Club of Qatar and the “3D Air Sports and Hobbies Association” (Philippines) were accepted as new Associate members for aeromodelling. Taking into account the decisions made in Dubrovnik, FAI membership now stands at 79 Active members, 9 Associate members, 9 Temporary members and 3 International Affiliates (100 in total). After a first term of two years, FAI President Wolfgang WEINREICH (Germany) was re-elected for a second period, ending at the 2004 General Conference. Elected at the 93rd General Conference 2000 in Linköping, all six FAI Executive Directors were re-elected for a new term of two years : Robert CLIPSHAM (Canada), Hideo HIRASAWA (Japan), Donald J. KORANDA (USA), Ivo MAZZOLA (Switzerland), Alvaro de ORLEANS BORBON (Spain) and Pierre PORTMANN (France). The 95th General Conference approved the Delegates nominated for FAI Commissions (http://www.fai.org/directory/ ), as well as the FAI Vice-Presidents (http://www.fai.org/directory/index.asp?id=2 ) for 2002-2003. For detailed information, please refer to the permanently updated Internet pages mentioned above. The General Conference was informed about the international calendar for sporting events 2003 (http://events.fai.org/) and the meetings for the next 12 months (http://www.fai.org/general/meetings.asp). For detailed information, please refer to the permanently updated Internet pages mentioned above. Marking the Aero Club of Switzerland's 100th anniversary year, the FAI's 94th General Conference was held at Montreux on Lake Geneva from 17-19 October 2001. The Conference was opened by the Director of Sports of the International Olympic Committee, Mr Gilbert Felli, who brought a special message to FAI from the new IOC President, Dr Jacques Rogge. circumnavigation of the earth (west-about and east-about), and the Russian cosmonaut Sergei Krikalev was awarded the Yuri Gagariun Gold medal for his pioneering first expedition to the International Space Station. The Conference debated the future form of the World Air Games and the possibility of having parachuting on the programme of the 2008 Olympic Games in Beijing. It was decided that the centenary FAI Conference in 2005 would be held in Paris, the city where FAI was founded. New members were admitted to FAI from Albania, Chinese Taipei, Ecuador, Panama, Peru, United Arab Emirates and Uruguay. Delegates rounded off their stay in Switzerland with a visit to Château d'Oex, the launch site of the Breitling Orbiter III balloon in which Bertrand Piccard and Brian Jones circumnavigated the earth in March 1999. The 94th FAI General Conference starts in Montreux Switzerland on 17th October 2001. Over 35 countries are expected to be represented. At the Opening Ceremony, the FAI Gold Space Medal will be presented to Mr Yuri Koptev, Director of the Russian Space Agency, for his work in directing the highly succesful MIR space station project. Also present will be Cosmonaut Sergei Krikalev, a veteran of MIR and member of the first crew to occupy the new International Space Station. He will receive the Yuri Gagarin Gold Medal for his achievements in the conquest of space. The Conference will consider new applications for FAI membership from Albania, Chinese Taipei, and Uruguay, and will discuss proposals for ensuring that all national member organisations of FAI are fully representative of their individual members. The main matter for discussion will be future policy for the World Air Games. Proposals for a revised concept, incorporating lessons learned in 2001, are being drawn up for delegates to consider.